It’s a big week for Kristina Swallow. It’s a big week for ASCE. With the ASCE 2017 Convention rolling into New Orleans, Swallow is set to be installed as the 2018 ASCE president, joining Norma Jean Mattei (2018 past-president) and Robin Kemper (2018 president-elect) as the first female trio of presidential officers in Society history. 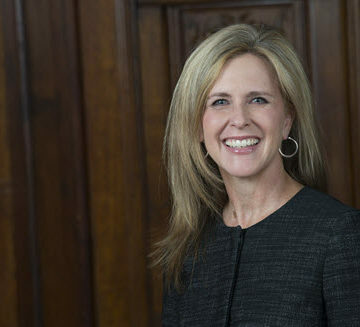 She talked with ASCE News in early September as she looked forward to her presidential year. 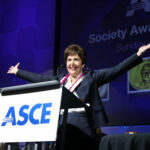 ASCE News: What are you anticipating from your presidential year? What are you hoping for? Kristina Swallow: “A lot of people have asked me about that recently – What exactly am I hoping for? And what do I hope to see at the end of the year? “And as I reflect on it, I really think that the best thing would be for us to have made progress toward our [Society] Vision. We have a Vision, we have a Mission, and we’re working on our goals. We [the ASCE Board of Direction] are updating our goals to make sure that they’re the best goals to achieve the Vision. ASCE News: Anybody who follows you on social media has seen you traveling all over the map during this President-Elect year. What’s that experience been like? Swallow: “I just got back on Tuesday [Sept. 12] from Duluth. It was the ASCE Congress on Technical Advancement for all of our technical organizations that aren’t part of an Institute already, which was fascinating. There was the infrastructure resilience division, the aerospace division, the cold regions division – they were engaging on their specific areas but also cross-pollinating with each other and learning from each other. “The things that our members are doing are fantastic and so incredible. And that’s probably one of the biggest takeaways from this year – getting outside of my practice area and my area of influence at home and learning what all our members are doing across the nation. Seeing how they’re impacting lives in so many different ways and really pushing the envelope on innovation and thinking about the future. “Another really cool takeaway – again, from the same conference – they were recognizing the centennial of the Duluth Section, and they had a member there, Robert Rhode, who’s 103. He still regularly attends Section meetings and asks questions. He’d served on the Board in the past; he’d been through of course all the chairs of the Duluth Section. We have fantastic members who really care about the organization and care about the communities they serve. “And the last really cool thing is we got to dedicate a civil engineering historic landmark. And that bridge, the Aerial Lift Bridge in Duluth, is so iconic to that community, you can buy Christmas tree ornaments at the airport of the bridge, which I of course did [laughs]. Because that’s really cool. ASCE News: And I ask you this week and it’s Duluth. But if I’d talked to you three weeks ago I’m sure it would’ve been the same enthusiasm for whatever event you’d just been at. You’ve been all over. You must feel really connected the Society, probably more than ever, right? “And I say, ‘Why wouldn’t you?’ This is the best opportunity. 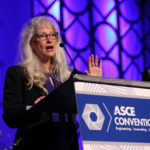 ASCE News: So obviously there is some history here, with the Convention coming up we’re going to have for the first time in Society history three women assuming the presidential roles. What’s it like to be in the midst of that? What do you think that says about where ASCE is right now? “And looking back and even while I was serving on it, I realized how fortunate I was to be on it because I learned so much from the other members on that committee about the challenges we face. And one of the things we talked about was why are we the Committee on Diversity and Women? Like shouldn’t we be the Committee on Diversity and Women and … and … and? And you can’t list everybody. I think it’s great for our organization, but I think it’s even better for the future of our organization when you have young girls that we meet at the STEM outreach events, and they can see there are women in the organization, leading the organization. “So today it’s the Committee on Diversity and Inclusion. And I think the work that they’re doing on that committee and the work that so many of our committees are doing to really encourage and create opportunity for our underrepresented groups, we’re starting to see the success in that, right? We’re starting to see the outcomes of that. “I remember last year when I got elected and I saw the results of the election and a third of our board was going to be female. And for the first time ever we had back-to-back women as president. And this year it’s more than a third will be women. We have the three presidential officers. “I can’t even tell you, it’s incredible. It gives me goosebumps that we’re at that point in our organization’s history that we went from me being the fourth woman as president to having three, four, and five right in a row. And we have a lot of women leaders behind us who are eligible and able to run for the position in the future. “I think it’s great for our organization, but I think it’s even better for the future of our organization when you have young girls that we meet at the STEM outreach events, and they can see there are women in the organization, leading the organization. “They see that via Norma Jean, me, and Robin. But they also see it at the local level, where Student Chapters and our Younger Members and our Section and Branch leaders have so many women engaged. And members of the underrepresented groups can see themselves in our profession and they can see themselves building a better quality of life, changing their communities. Congratulations on being elected the President of ASCE. As a long time ASCE member since my university days at Texas A&M in th 1980’s it is great to see the progress that this Society has made and the international role model it has set with membership in over 177 countries as per the Web-site. With the groundbreaking advancement of breaking a barrier to have women in our leadership positions, I have a humble suggestion to also take it to the next leadership level globally for our Society. My suggestion would be for the Board to consider changing the name from the “American Society of Society” to the “Universal Society of Civil Engineers” with The ultimate goal of having a chapter in every country around the globe to share ideas that are universal in technical terms! It would be similar to the “United Nations” with its headquarters in the US that is know globally for its leadership. I hope that this will then Set the tone to carry on this legacy to future generations.